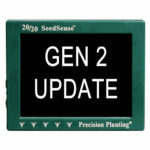 As we are all preparing for PLANT18, take time to make sure that your 20/20 SeedSense software is up to date, and that your iPad and FieldView Cab are all synced with your 2020 SeedSense monitor. It is important to update your monitor in the event that tech support is needed in season, as that is the first question our support team will ask you. If you are only running 20/20 SeedSense and not FieldView Cab, but would like to stay on your current version then we ask that you at least have the latest update and boot software on a USB with you in the tractor during the planting season. It will then be available for quick access in case it is needed. Below you will find all the necessary info to make this process as easy as possible! Insert the USB into the 20/20 and press SETUP, DATA, and SOFTWARE UPDATE. If you run into any issues please call us at 905-765-0952 for assistance. When you click on the appropriate link, it will begin downloading on your computer…you can usually find the files in your “Downloads” folder. Do not download or click more than once as it will skew the name and make it unreadable by SeedSense. You can recognize this error as it will add a number to the end of the name. Remember that all the files you download MUST be in the root directory of the USB and NOT in a folder. Also the file name cannot have any brackets at the end of the name. The file names should look exactly as follows to ensure SeedSense will see them. We highly recommend checking before you go to the field!! GEN 1 SeedSense monitors are currently still supported but Precision Planting is not writing new software going forward.